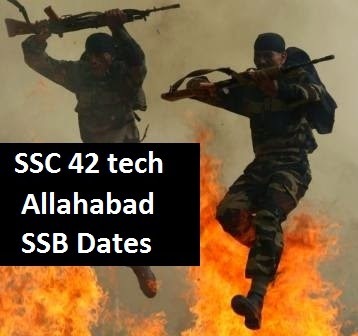 Indian Army has published Allahabad SSB board interview dates for SSC Tech 42 course. Check out complete list including SSB interview dates, reporting time and cut off of 42 SSC Tech course. Army has invited applications for 42 SSC Tech course from eligible candidates. All selected candidates will become technical officers in Indian Army and work for the nation. Today, Indian Army has published list of SSB center allotment list of SSC Tech 42 course. Also Indian Army has published SSB interview schedule of SSC Tech 42 course. There are total 15,379 candidates who will be appearing in SSB interviews through Allahabad SSB board. First interview will start on 20 Nov 13. Last SSB interview date is 13 January 2014. Absentees may appear on 13 January 2014. SSB interview dates of Bhopal and Bangalore are yet to be finalized by Army officials. We will update here as soon as the SSB dates of 42 SSC Tech course are announced. Check out SSB dates of 42 SSC Tech course here. We suggest candidates who are fresh to SSB interviews, to attend SSB coaching from best SSB coaching academies so that chances of getting recommended will be more. Also we would suggest candidates to download our SSB interview PDF guide to get an insight on SSB interview. To change SSB interview dates, candidate must obtain prior permission from SSB selection board. All candidates appearing in SSC Tech 42 course SSB interview in Allahabad board need to report at MCO office located at platform no 1 in the railway station. Reporting time for all SSB interview dates is 0600 AM. Candidates who have scored more than 64 % or 64% in engineering first six semesters are eligible to appear. So go on and plan your reservations well in advance as trains are packed due to Diwali festival.